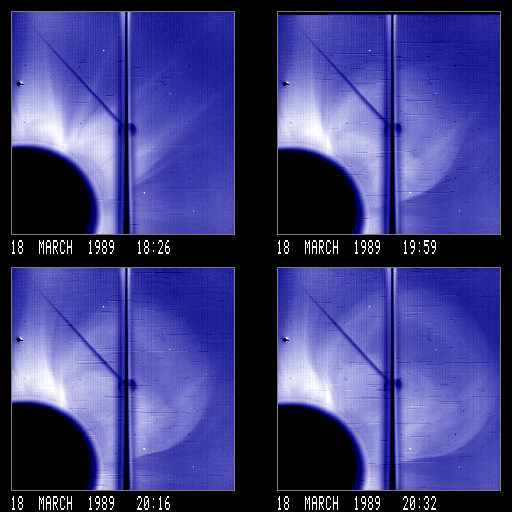 The SMM Coronagraph recorded three mass ejections on March 18, 1989. The last of these is illustrated in the four images shown above. This event involved a broad loop with an inner core ejected over the west limb. The earlier events occurred over the southwest and east limbs. Images from the southwest and west limb events are included below. Solar north is toward the upper left in each image. Loop/cavity with highly structured, inner (prominence) loop/cavity in streamer. Streamer is blown out. Deflections. Big loop/cavity and amorphous core superposed on streamer. Big deflections. Streamer is blown out.